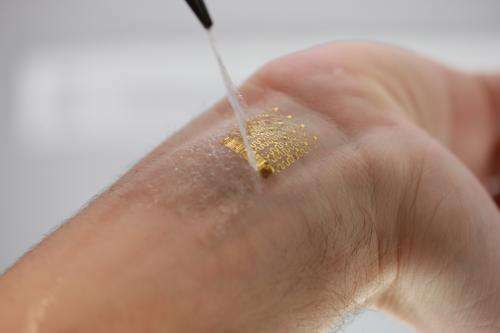 (Phys.org) —A diverse team of researchers from the U.S., China, and Singapore has created a patch that when glued to the skin can be used as a thermometer—continuously measuring skin temperature. In their paper published in the journal Nature Materials, the team describes how the patch is made and ways it can be used. The team was led by John Rogers of the University of Illinois—he has been working on ultra-thin electronic skin patches for several years. Just two years ago, he and his team developed a skin patch that sported sensors, radio frequency capacitors, LEDs, transistors, wireless antennas, conductive coils and even solar cells for power. Other researchers have also been hard at work developing patches for applying directly to the skin, or in one case, a tooth. 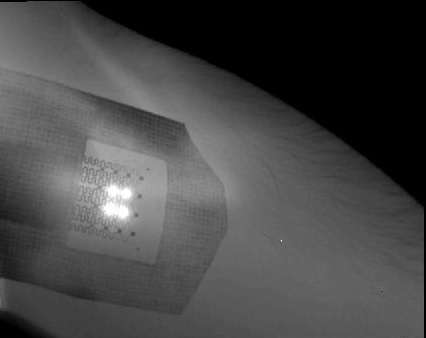 In this latest effort the researchers have fine tuned a patch that resembles a tattoo once applied—it's meant for one specific task—monitoring skin temperature. The patch is small, of course, just inches across, and extremely thin. It's also pliable—it'll keep working even when the skin to which it's attached twists and turns. The idea for the patch is that it can measure body temperature (at the skin level) very accurately, and over a continuous period of time. Also, because it measures heat at multiple locations (at the same skin site) at the same time, the patch is capable of monitoring heat flow and the constriction and dilation of blood vessels as they respond to the environment around them. The patch looks like a bar-code tattoo and is applied using special glue. Thus far, the team has created two versions of the patch that operate in slightly different ways, but offer the same end result—heat readings. The team says that the patches can work in reverse as well, delivering heat to the skin, if desired, simply by increasing the voltage. The patch isn't ready for use by the general population just yet, however, as it still requires an external power source. The team is investigating different sources for different types of patches—solar for those applied to the skin and bioelectric for those applied inside the body, such as to the outside of organs. Precision thermometry of the skin can, together with other measurements, provide clinically relevant information about cardiovascular health, cognitive state, malignancy and many other important aspects of human physiology. 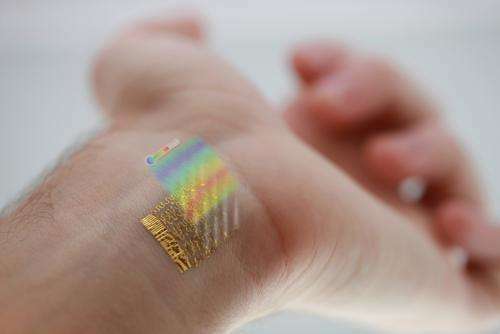 Here, we introduce an ultrathin, compliant skin-like sensor/actuator technology that can pliably laminate onto the epidermis to provide continuous, accurate thermal characterizations that are unavailable with other methods. Examples include non-invasive spatial mapping of skin temperature with millikelvin precision, and simultaneous quantitative assessment of tissue thermal conductivity. Such devices can also be implemented in ways that reveal the time-dynamic influence of blood flow and perfusion on these properties. Experimental and theoretical studies establish the underlying principles of operation, and define engineering guidelines for device design. Evaluation of subtle variations in skin temperature associated with mental activity, physical stimulation and vasoconstriction/dilation along with accurate determination of skin hydration through measurements of thermal conductivity represent some important operational examples.